9/26/2003 02:06:24 PM Mountain kb:: speaking of Milwaukee, go Stros. 9/26/2003 02:03:59 PM Mountain dst:: yeah I guess Miller is Milwaukee?? 9/26/2003 02:00:59 PM Mountain kb:: K9..? 9/26/2003 01:55:46 PM Mountain bkw:: K-9 suits hime more than G-9 out with a point. 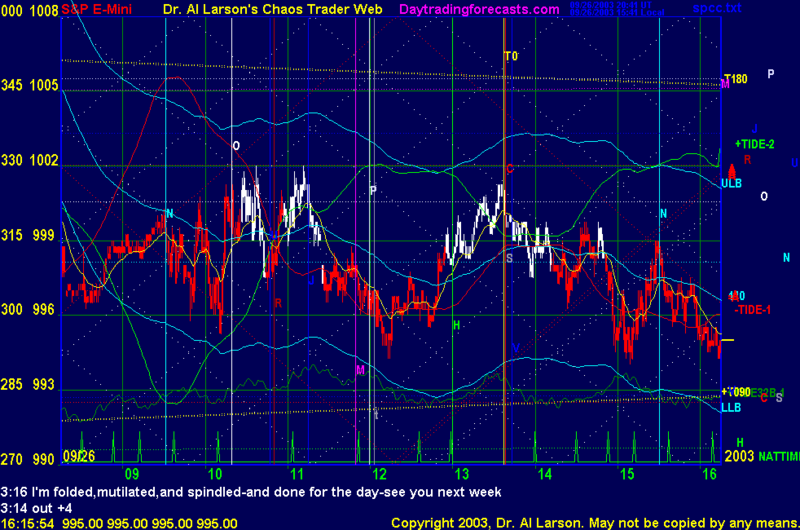 9/26/2003 01:54:02 PM Mountain wlj:: after last week perhaps thr return of g9 sent al in to orbit. 9/26/2003 01:43:38 PM Mountain bkw:: he seemed to have left in mid sentence and the numbers with him??? 9/26/2003 01:40:07 PM Mountain dst:: Al's commenting quit on the Clinic? 9/26/2003 01:20:37 PM Mountain kb:: Change in trend..? 9/26/2003 01:20:19 PM Mountain kb:: CIT..?? 9/26/2003 01:17:51 PM Mountain kb:: Hi g9..
9/26/2003 01:17:41 PM Mountain kb:: still a shot that we're still in an ellipse, just a bigger one than Al talked about..
9/26/2003 01:10:04 PM Mountain bkw:: G-9 just got run over by a truck full of anvils! 9/26/2003 12:45:12 PM Mountain bkw:: just slathered moon grease on the rails hope it works! 9/26/2003 12:28:42 PM Mountain bkw:: I'm getting the feeling we get a repeat of yesterday new lows into the close-hope so! 9/26/2003 11:50:43 AM Mountain kb:: nice trade on the options..
9/26/2003 11:49:40 AM Mountain kb:: bkw, Snag-it is a good screen caprture program..if your looking..
9/26/2003 11:34:08 AM Mountain wlj:: a.m. sp heart beat = every :10 to :15 after the hour since the open. 9/26/2003 10:41:07 AM Mountain bkw:: it's sure clinging to the red tide. 9/26/2003 10:22:10 AM Mountain bkw:: out plus two and a bit. 9/26/2003 10:15:41 AM Mountain bkw:: stop 997- WLJ yes it is but I have it overlaid on the spoo chart and the channel signals are quicker to recognize than the chart. 9/26/2003 10:10:08 AM Mountain wlj:: bkw, look at aux page is that the whole thing ?? 9/26/2003 10:09:31 AM Mountain bkw:: at the time I captured that- those bands were tight as price converged- the channels expand and contract with the market. 9/26/2003 10:02:42 AM Mountain Al:: I put it in the aux page so all can see-is it time to program "share a chart" ? 9/26/2003 10:00:43 AM Mountain bkw:: Al - disregard I've sent it to Wlj and Dst-on its way guys. 9/26/2003 09:50:42 AM Mountain bkw:: Al- could you forward it to WLJ and DST-Thanks. 9/26/2003 09:34:47 AM Mountain bkw:: Well Al-it does show the movement before you can see it on the chart-try it-it works for me. 9/26/2003 09:32:07 AM Mountain bkw:: WLJ and DST-once we hear if the boss got it?? we'll ask him to forward it to you two and anyone else who wants it-if he didn't get I'll go back to the drawing board. 9/26/2003 09:27:27 AM Mountain bkw:: sold 999 stop 02-Al did it come thru??? 9/26/2003 09:01:00 AM Mountain wlj:: bkw, dandy option trade. 9/26/2003 08:58:15 AM Mountain bkw:: Looking at the wilshire index (tmw) which is the index for every stock listed on all exchanges-it is getting hammered. It's a good one to watch as a signal for the Spoo futures. 9/26/2003 08:54:57 AM Mountain bkw:: We wanted volatility we got it alright.sold my 1050 puts at 999-will reload lower if we break down. 9/26/2003 08:43:51 AM Mountain bkw:: WLJ- I'll try that after the close-did you get the price chart on the model on the site??? 9/26/2003 08:35:34 AM Mountain wlj:: bkw, my chart program has email built in. if you got a manual with what you use check that or call tech people, maybe they can tell you. 9/26/2003 08:31:50 AM Mountain bkw:: AL- I don't think I have a screen capture program??? Maybe WLJ can get it off the site?? 9/26/2003 08:10:32 AM Mountain wlj:: bkw, same subject as al, i went to the web site, a number of options, which one do click on ?